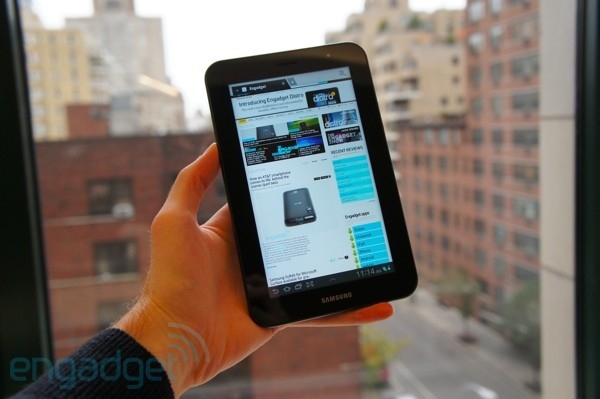 "We've already established that the Galaxy Tab 10.1 is a great tablet. Then, just recently, we summarily found that the 1.2-inch smaller Galaxy Tab 8.9 is an even better tablet -- at least for anyone who wants to take their slate places. So, following that logic, the even more petite Galaxy Tab 7.0 Plus should be the best of the three, right?" I'm not a fan of the Galaxy Tab 10.1 because of the lack of MicroSDHC, MicroHDMI, and MicroUSB. The Galaxy Tab 7.0 Plus actually adds MicroSDHC so that's cool but it has a 1024x600 screen instead of the 1280x800 screen on the larger models. Keep in mind though, while the resolution is lower the screen is significantly smaller so it actually has a higher dpi then the 10.1 at 170dpi compared to 149dpi on the 10.1 - so it will look sharper at the same distance. The 8.9" model actually has the same dpi as the 7" at 170dpi. One interesting difference is the inclusion of an IR port and software that let you use the Galaxy Tab 7.0 Plus as a universal remote. The review shows good performance, thanks to a 1.2GHz processor and 1GB of RAM, and battery life so if you're looking for a 7" tablet you should definitely check it out.